Once again Chinese troops crossed the Line of Actual Control, (LAC) and entered about 14 kms inside India in Dibang valley of Arunachal Pradesh. Kenu Miso, a Local resident sent the photographs of the Chinese troops to Arunachal24.in . According to Kenpu , About 10 Chinese troops entered approximately 14 km inside India, near the banks of Mathu and Emra rivers where they setup their tent and stayed for a few hours and then went back. They also hired Indian porters and the photographs have been clicked by one of those porters. Kenpu further informed Arunachal24 that this incident is happened ten days ago. This isn’t the first time Chinese troops have entered India, staying for a few hours and then going back. 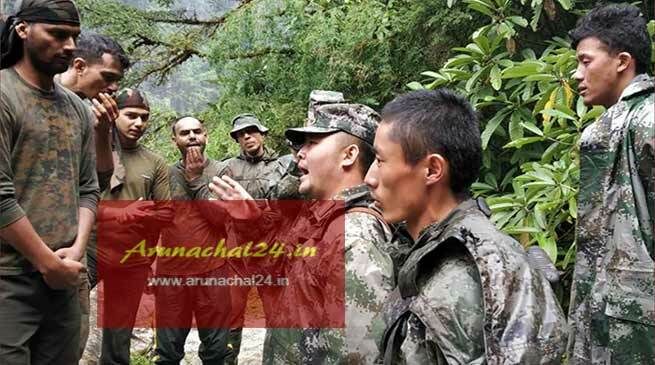 One of the photographs showing PLA personnel in a discussion with Indian troops while local residents being unaware about the topic of their discussion. When Arunachal24 asked with the SP, Dibang for further query, his reply is wasn’t satisfactory. However DGP Arunachal Pradesh, SB K Singh said that the photographs showing the Chinese troops may be old or of some other place as there is no information of any current intrusion into Indian Territory. Chinese soldiers were spotted by local villagers who had gone out hunting. The locals then clicked photographs of the intrusion and alerted the Army and local administration of the same. It is believed that the intrusion took place about five-six days ago. The troops were about one km inside the Indian territory.